Purchase a piece of Nordic jewelry in Riften and read the Certificate of Authenticity. Travel to Solstheim and locate Hugin Ice-Shaper west of Raven Rock. Read Hugin Ice-Shaper's Notebook and craft an item of Nordic jewelry to complete the quest. This quest will be added to your journal upon installing the Nordic Jewelry Creation. You will be directed to Riften to purchase an item of Nordic jewelry. You can purchase same from the Pawned Prawn or from Madesi's stall in Riften Grand Plaza. You have the option to purchase a Nordic Amulet, Nordic Circlet, or Nordic Ring in order to progress the quest. Note that they are all relatively pricey given that they're pieces of jewelery. Once you've bought your desired item, a Certificate of Authenticity will be added to your inventory. Read it to learn that the creator of the jewelry is a craftsman named Hugin Ice-Shaper who can be found on Solstheim. 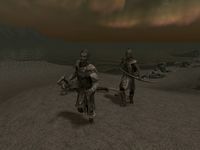 Travel to Solstheim and you will be directed to a spot west of Raven Rock, in the ash wastes just north of the Earth Stone. There you will find two hostile reavers (a melee fighter and an archer) standing over the body of Hugin. Dispense with them both and loot the melee reaver for three powerful enchanted items: a Nordic Amulet of Eminent Health, Nordic Circlet of Extreme Magicka, and Nordic Ring of Eminent Stamina. [verification needed — are these leveled?] You can then locate and read Hugin Ice-Shaper's Notebook to learn how to craft Nordic jewelry. To complete the quest, you will need to craft a piece of Nordic jewelry yourself. Be sure to grab the required components from the satchel next to the body: 3 samples of Stalhrim and 3 Quicksilver Ingots. Head back into town and find a forge in order to craft the jewelry of your choice and finish the quest. 0 I've heard traders are selling unique jewelry from Solstheim. I should see what they have to offer. 20 This jewelry is made exclusively by a man named Hugin Ice-Shaper in Solstheim with rare stalhrim ore. Perhaps the craftsman has more items for sale. I should visit him in Raven Rock. 30 I have located the craftsman, but a pair of bandits seem to have found him first. I should search the area before anything of value is lost. 30 I stumbled on a bandit attack near Raven Rock. I should search the area before anything of value is lost. 50 Hugin Ice-Shaper met an untimely fate. I recovered his belongings before they could be looted by reavers. With what is left of his notes, perhaps I can continue his work. 100 Finishes quest Using Hugin Ice-Shaper's notes, I learned to forge my own pieces of Nordic Jewelry. The following empty quest stages were omitted from the table: 25, 255. On the PC, it is possible to use the console to advance through the quest by entering setstage ccEDHSSE001_CraftsmanEncounterQuest stage, where stage is the number of the stage you wish to complete. It is not possible to un-complete (i.e. go back) quest stages, but it is possible to clear all stages of the quest using resetquest ccEDHSSE001_CraftsmanEncounterQuest. This page was last modified on 31 August 2018, at 23:14.